Recently analyzed data from the BaBar experiment may suggest possible flaws in the Standard Model of particle physics, the reigning description of how the universe works on subatomic scales. 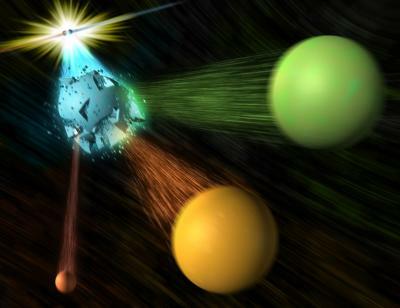 The data from BaBar, a high-energy physics experiment based at the U.S. Department of Energy's (DOE) SLAC National Accelerator Laboratory, show that a particular type of particle decay called "B to D-star-tau-nu" happens more often than the Standard Model says it should. In this type of decay, a particle called the B-bar meson decays into a D meson, an antineutrino and a tau lepton. While the level of certainty of the excess (3.4 sigma in statistical language) is not enough to claim a break from the Standard Model, the results are a potential sign of something amiss and are likely to impact existing theories, including those attempting to deduce the properties of Higgs bosons. Researchers continue to apply BaBar data to a variety of questions in particle physics. The data, for instance, has raised more questions about Higgs bosons, which arise from the mechanism thought to give fundamental particles their mass. Higgs bosons are predicted to interact more strongly with heavier particles -- such as the B mesons, D mesons and tau leptons in the BaBar study -- than with lighter ones, but the Higgs posited by the Standard Model can't be involved in this decay. The results have been presented at the 10th annual Flavor Physics and Charge-Parity Violation Conference in Hefei, China, and submitted for publication in the journal Physical Review Letters. The paper is available on arXiv in preprint form. This work is supported by DOE and NSF (USA), STFC (United Kingdom), NSERC (Canada), CEA and CNRS-IN2P3 (France), BMBF and DFG (Germany), INFN (Italy), FOM (The Netherlands), NFR (Norway), MES (Russia), and MICIIN (Spain), as well as support from Israel and India. Individuals have received funding from the Marie Curie EIF (European Union) and the A.P. Sloan Foundation (USA).